For additional information about this book, visit the website BehindtheWallStories.com. In this unique perspective on mental illness, parents tell the dramatic true stories of grief, hope, and recovery. Mental illness profoundly impacts family and loved ones. These seven true stories told by nine parents were selected from interviews conducted by sisters, Mary and Elin Widdifield, and interwoven with one sister’s own experiences. Told with remarkable candor, these stories offer more insight than any single story or academic analysis. Behind the Wall provides a shared voice for millions of people who advocate for a child or loved one who lives with mental illness, fosters a better understanding for society at-large, and delivers a compelling and ultimately hopeful read for anyone fascinated by the human condition. According to the National Institute of Mental Health, nearly twenty million Americans ages eighteen and older suffer from a serious mental illness. Sixty million — about one in four adults — suffer from a diagnosable mental disorder in a given year. Factor in the family members profoundly affected by a loved one’s disorder and mental illness touches virtually all of us. Yet it remains a subject that is often misunderstood, rarely talked about, and frequently stigmatizing. When mental illness enters the national discussion, it typically comes in the wake of a violent tragedy, attracting temporary attention and further misunderstanding. 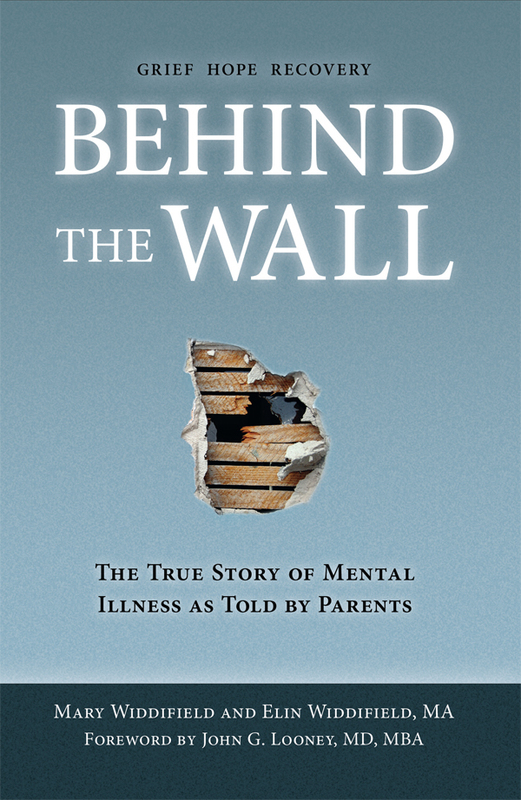 Behind the Wall posits that while mental health professionals and policy makers provide invaluable perspectives, the true story of mental illness can be told most accurately by the people in the trenches: the parents who watched it all unfold with their child in harrowing and heartfelt detail. Behind The Wall is a collection of seven true stories of adult children who live with serious mental illness told with remarkable candor by parents who witnessed the often harrowing and other times hopeful events along their challenging journey. Parents introduce children through memories of early childhood and any first symptoms. Chapters 2 - 8 are single narratives about each child. Chapters 9-10 interweave discussions on grief, coping, expectations, acceptance, recovery, and hope. Behind The Wall resists a scholarly approach, but through the power of story illustrates real struggles of caring and advocating for a mentally ill person. Professionals know research, but many do not live with a mentally ill person. Perspectives presented are valuable to any parent but critically so to those whose child is newly diagnosed. Parents living similar experiences will feel less alone. Supporters of caregivers gain empathy; professionals learn the truth about what goes on behind the wall. Mary Widdifield received her MA in English and creative writing from San Francisco State University where she received the Wilner Award for short fiction. Mary’s fiction and essays have appeared in Transfer Magazine, San Francisco Chronicle, and Able Muse. Mary is a grant writer for nonprofits. She lives in Northern California with her husband and two children. Elin Widdifield received her MA in counseling psychology from Tufts University and completed an externship in family therapy at The Philadelphia Child Guidance Center. She has worked extensively with adolescents, families, young adults, and sexual assault survivors. Elin has documented oral histories, including life experiences of combat veterans. Elin resides in North Carolina where she is on the boards of NAMI (the National Alliance on Mental Illness), and the UNC Center For Excellence in Community Mental Health. She is the mother of two sons.